Dorsey Brooks remembers that his father used to sit on the porch as people rode their wagons to and from town. It was common for people to direct their horses into the yard, get off the wagons, sit a while on the porch, and talk about their life before heading on their way. What makes “my porch” a place that feels like home for Dorsey is that it used to be his home back in the seventies. When he comes into the church office, he sees the layout the way it used to be and not just the way it is, commenting where the living room and the bedrooms used to be. But long before there was ever a home on 81 Institute Street, it was the site of Martin Institute, the first privately endowed educational institute in the United States. Dorsey has a picture of the two-story brick building, crowned with a belfry, hanging in his home. He also has a picture of that place burned into his mind because that is where he received most of his education as a boy and teenager. Lately I've noticed a tear or two in Dorsey's eyes as we sit on the porch. As he recalls all that has happened in his life, the good times and the difficult ones, he eventually turns his thoughts to God. He sounds like the psalmist who wrote: “I remember the days of long ago, I meditate on all your works and consider what your hands have done ( Psalms 143:5 ). The tears come from the well of thanksgiving and praise. Dorsey realizes that few are blessed to live as long as he has or stay as active for so long. For most of the 99-year olds, the greatest days of their lives were long ago. 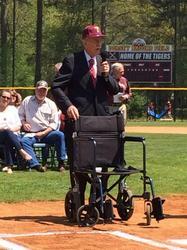 Yet Dorsey continues to celebrate life and others have helped him celebrate past achievements as recently as last month in Tucker, Georgia by naming the Tucker High School baseball field “Dorsey Brooks Field.” Dorsey was on hand two years ago when the school played its first game on the field and he was honored by getting to throw out the first pitch. Last month, Dorsey, his wife Diane, Dorsey's four children, a group from his Sunday School Class at First Baptist Church, and about 100 Tucker supporters were on hand for the dedication ceremony. 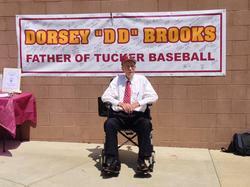 Dorsey has been given the title: “Father of Tucker Baseball,” having developed the program from scratch in 1947. Not only did he coach baseball: he coached football, basketball and track. In addition to all those duties, he taught physics and had to maintain the fields and the gymnasium. He put Tucker on the map with thirteen straight regional titles in baseball and led the baseball team in 1956 to the school's first state championship in any sport. Being successful, 'believing you can win,” as Dorsey puts it, gave him a platform to teach and guide young men in areas where their decisions about life counted the most. While everyone praised Dorsey for being a winner, it was clear that the highest praise was reserved for Dorsey's character. Dorsey has changed a lot of people's lives by his positive attitude and encouragement. Whether it's the children in the Incentive Reward Program he started at Jefferson Middle School in 2006 or his teaching the Baraca Sunday school Class at the First Baptist Church, Dorsey has always been about trying to make the lives of other people better. There was a time when life moved a little slower and it wasn't unusual for people to stop and visit with others on a front porch. Whenever Dorsey stops by or whenever I visit with him and his wife Diane, I usually can count on getting some coaching. Dorsey has lived long enough to have some wisdom, so I listen like a pitcher listens to a manager when they have a chat on the mound. While he would not think of himself as a person who doles out great insight, you can't sit on the porch wih Dorsey long without picking up a nugget of truth that he has found through his long journey of faith. My guess is that if we all did a little more porch sitting, listening and sharing with each other, all of our win-loss records might improve. Reprinted from the May 7 issue of the Jackson Herald. Mr. Dorsey D. Brooks in 1964. Mr. Brooks has been called "The Father Of Tucker Baseball". 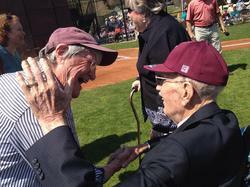 Coach Brooks visits with a member of his 1956 Tucker High School state championship baseball team during the field name dedication ceremony. Coach Brooks addresses the crowd at the field name dedication ceremony. 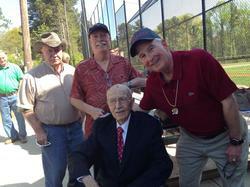 Tucker supporters with Coach Brooks at the field dedication ceremony on April 12, 2014. 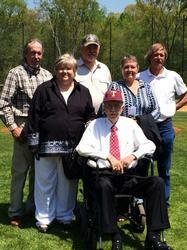 The Brooks family at the field name dedication ceremony on April 12, 2014. 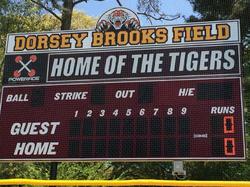 Congratulations Coach Dorsey D. Brooks on the naming of the Tucker Tigers baseball field in your honor. At the 2013 Jefferson Memorial Stadium ~ 50th Anniversary Tribute: L-R - Gary Brooks, Roberta Brooks, Dorsey Brooks and Diane Brooks.